Hanging up the blue jacket can be an emotional time for a retiring FFA member. They have invested countless hours in preparing for contests, developing leadership skills, and organizing their Supervised Agricultural Experience (SAE) project. Many are faced with the question of “what now?” For many, the Grange serves as the springboard for FFA alumni looking to take the next step in life. From its inception, the Grange has advocated agricultural education, and has been an ardent supporter of FFA. Formerly known as the Future Farmers of America, the FFA was formed in 1926 to augment what was taught in the classroom with extracurricular activities. The Grange supported vocational education efforts, including the passage of several laws that lead to the FFA’s formation. The first FFA Executive Secretary, Henry Gloscose, was also a Seventh Degree Grange member, and is the author of the FFA Opening and Closing Ceremonies. Victor Salazar, 2010-2011 Connecticut FFA State President said, “Both organizations are rooted in agriculture, both promote excellence, and both make the member a better individual.” Salazar served as the 2008 National Grange Youth Master as part of the National Grange Youth Officer Team. “I believe the best way to illustrate the connection between the Grange and the FFA is to look at the closing charge of the Master in the Grange and the President in the FFA;” he cited the charges’ common themes of diligence in labor, honesty and fairness. While each is said differently, the similarity is undeniable. “These were written more than 50 years apart from each other, yet they say basically the same thing. To me this exemplifies the connection between the two organizations the best,” Salazar said. “That is why the connection is so positive. You learn the skills on one side [in FFA] and then use them on the other side in Grange,” said Luttrell. During his time in the Hillsboro Mid-High chapter in Oregon, Luttrell said he participated in every FFA contest possible, soaking up information “as a sponge.” A favorite contest was parliamentary procedure, a skill that comes in handy in his current role as National Master. “Hanging up my blue jacket was a very tough realization and the end of an era,” Tart said. 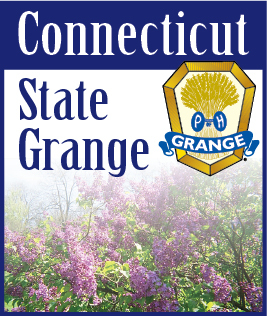 “However, having the Grange there helps fill the void immensely. I know that it is an organization that has a passion for agriculture and helps improve the youth of today and those two things are what I am passionate about.” She also noted her dedication to agriculture and education did not have to end with FFA and that she is able to continue her work, just in a different way. 2009 National Youth Officer Team Master Joe Stefenoni of California encourages FFA members to seek the Grange to use their talents; “Once FFA members are out of high school they have very few places to use those skills, and the Grange is one of the places they can.” He is a member of the Sebastopol- Analy FFA chapter. Pennsylvania’s Gail Switzer, 2008-2009 National Grange Youth Mentor, and Conrad Weiser, FFA Alumni, said the National Grange Youth Department activities allow her the opportunity to continue her leadership growth through contests such as public speaking, gaining responsibility by completing tasks, and making her community better through Grange service projects.